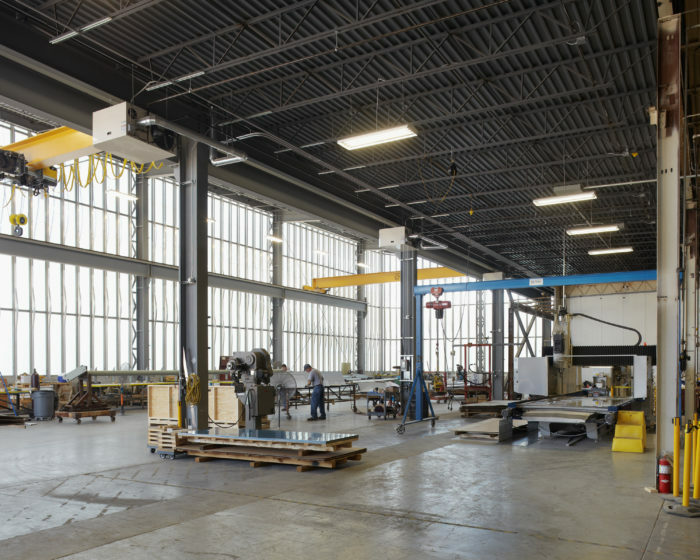 A. Zahner Company’s continuing success as one of the world’s foremost architectural metal manufacturers prompted the need for an expansion of their manufacturing facility. Wallace Engineering provided structural and civil engineering services for the expansion, a 10,000-square-foot structure that houses fabrication and functions as the primary loading dock for their campus. 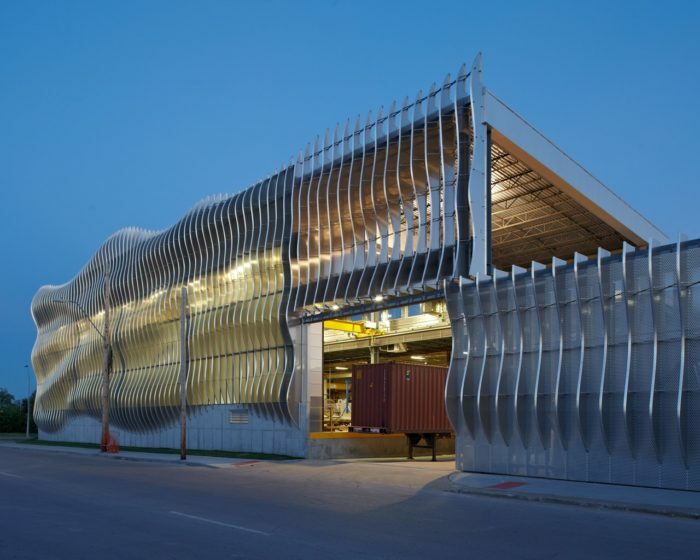 To provide energy efficiency, the north and east wall of the new facility were to be clad in etched glass to provide for interior light without need for electrical lighting during the day. Because the facility is within four feet of a busy street, it needed to be screened for visual privacy. 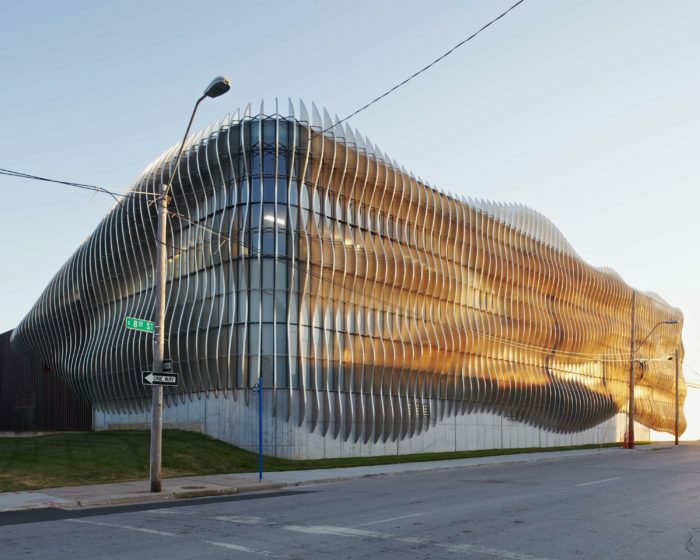 Zahner gave the architect free reign to see how far they could push the envelope on curtainwall design because of the desire to create an icon in their hometown of Kansas City. 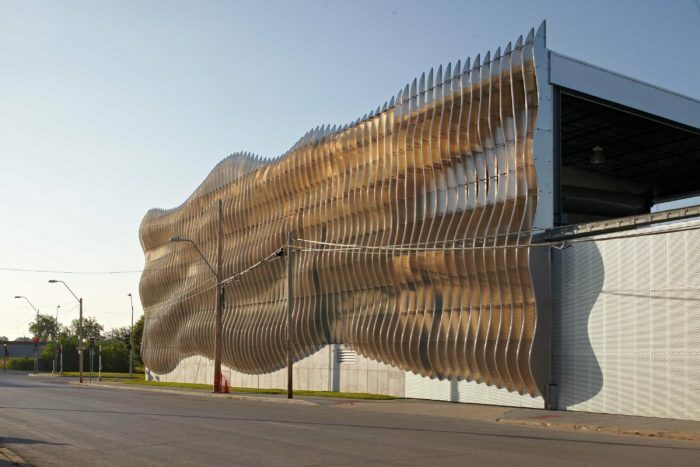 The result is a billowing wave of aluminum that flows down the wall and around the corner. 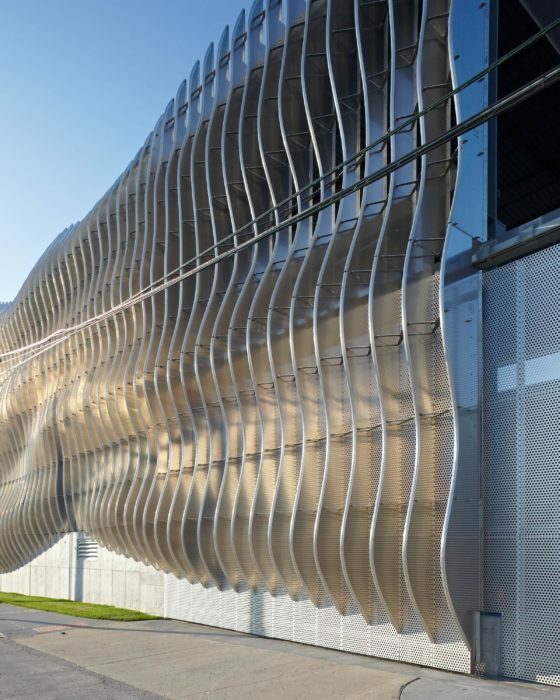 Daylight passes between the deep structural “fins” which act as mullions. The fins are built-up aluminum plate girders comprised of a cut plate web that has a shaped closed section flange attached. To keep the glazing as unobstructed as possible, there were to be no wind girts between floor and roof and bridging between mullions needed to be kept to a minimum and held back from the flange. This was achieved by using thin sheet x-braces, which occur at glazing joints. The two-piece x-brace allows the brace to be adjustable depending upon depth of the mullion but standard in length. Because of the depth of the mullion fins, analysis of wind caught by the profile was needed to resist torsional stresses in the otherwise laterally weak sections. In-plane bracing of the curtainwall occurs at the columns. 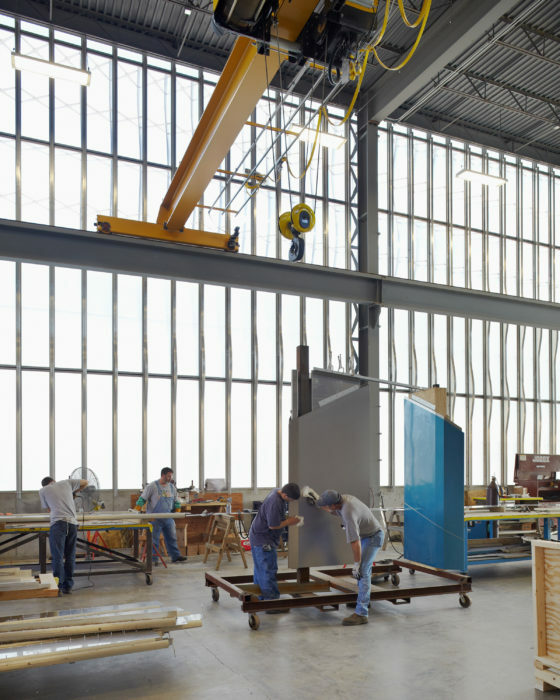 The muntins between panels of the glazing system function as drag struts and transfer load to vertical trusses in the curtainwall, which are obscured by the columns. 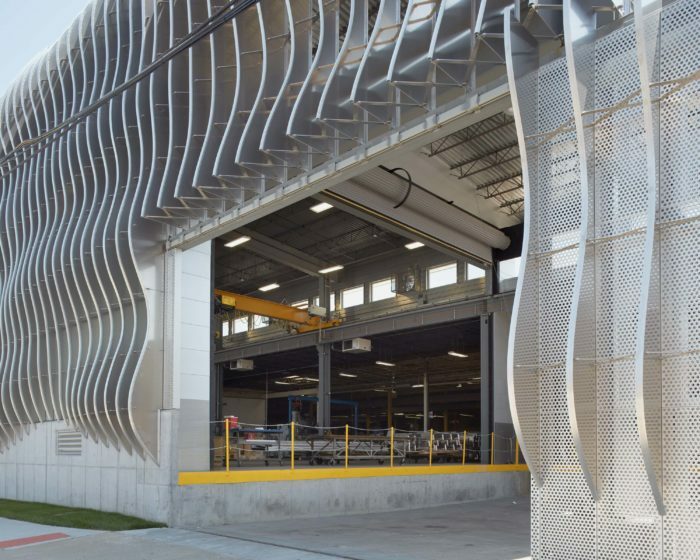 The fin pattern was carried onto the rolling gate that screens the loading dock. This provides privacy from the street and continues the curvilinear pattern. 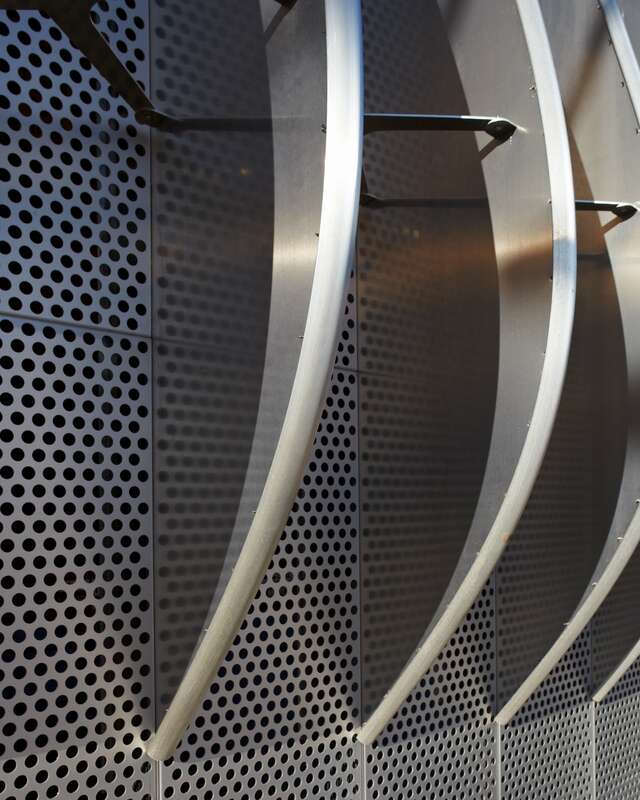 The glazing stops at the gate and perforated metal fills the space between fins.